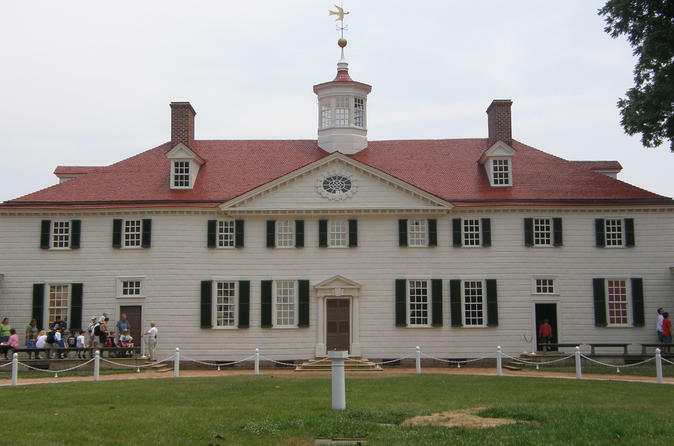 Discover George Washington's Mount Vernon home in Virginia. You'll walk through the mansion which has been restored to the way it looked in 1799. You'll see a 4D movie where it snows in the theater when it snows in the movie. On the way take a ride through historic Alexandria. You'll hop off at Christ Church where George Washington and Confederate General Robert E. Lee attended service. You'll enjoy lunch at Mount Vernon then you'll head to Arlington National Cemetery to see the Changing of the Guard, and you will have the opportunity to pay your respects to John F. Kennedy. Begin your day with your tour professional picking you up from your hotel with warm bagels with cream cheese, fresh fruit, muffins, coffee, orange juice, apple juice and bottled water. You'll enjoy your small breakfast en route to Mount Vernon. You'll ride through historic Alexandria with live guide narration. Your guide will point out historic points of interests, and you will also hop off for pictures at Christ Church where George Washington and Confederate General Robert E. Lee attended service, also George Washington's Masonic Temple. When you arrive at Mount Vernon you'll walk through the mansion that has been restored to the way it looked in 1799. You'll walk through the grounds, and see the tomb of George Washington, the slave memorial (dedicated to those who were enslaved at Mount Vernon), and also the Wharf where he brought in millions of pounds of fish. You'll have lunch, then it's off to Arlington Cemetery. The tranquil Changing of the Guard ceremony is completely awe-inspiring, and you will also pay your respects to John F. Kennedy. Your tour professional drops you off right where they picked you up and your day is complete.